What to expect ? 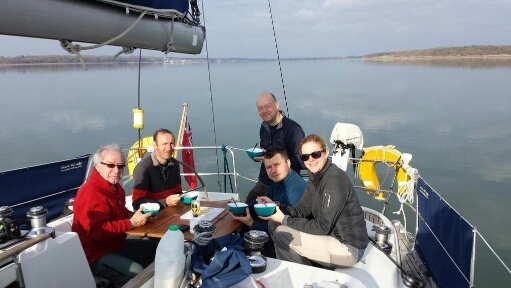 You join the yacht at Ipswich Marina meet the skipper and up to 4 other crew. The other crew may be first timers, or doing a weekend sail. You will be shown around the boat, allocated a cabin (you sleep on the boat) and, after a safety briefing we will usually sail asap. You will be involved sailing the yacht from the beginning you will be helming the boat down the river. you will spend a day at sea ‘learning the ropes’, how to steer the yacht, set and trim sails, tack and gybe and lots more. Lunch will be ‘on-the-go’. On Saturday night you will find yourself perhaps at another anchorage, or alongside.Dinner is on-board. you will sleep well that night ! A early-ish start for an FUN sail back to Ipswich.finishing about 1500 on the Sunday. All meals on board, fuel, mooring fees are included in the price. Gor-tex sailing waterproof clothing is supplied FREE of charge. You will receive a list of what to bring when you book. I wanted to send you a quick email to give you some feedback on the Start Yachting course Dan & I completed last weekend. I selected your company based purely on internet research, where you appeared to offer one of the best-equipped boats for a reasonable price (including waterproofs and food for the weekend is a nice touch). We weren't disappointed upon seeing Sirius, which is a very tidy boat, surprisingly spacious and obviously well cared for. Ian was a great instructor; very patient with us first timers whilst trying hard to cater for the varying experience levels aboard the boat that weekend. He selflessly prepared all the meals during the weekend, which were simple yet very tasty. He never outwardly grew bored with answering our questions, and made the whole experience very interesting yet relaxing. I would happily recommend Ian and your company, and Dan & I look forward to completing our Competent Crew course in the future.